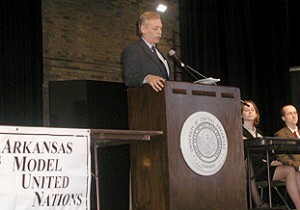 Congressman Vic Snyder speaking during the opening session of the 2002 AMUN Conference. Welcome to the homepage of the Arkansas Model United Nations (AMUN) program! Since its founding in 1966, the AMUN program has involved the participation of thousands of high school students throughout Arkansas and neighboring states. For more than five decades, the AMUN conference has been one of the largest high school Model UN conferences in the U.S. Since 2001, 74 high schools in Arkansas, Florida, Mississippi, Missouri, Oklahoma, Tennessee, and Texas have participated in the annual AMUN conference on the campus of the University of Central Arkansas each November. The annual AMUN conference is sponsored by the Department of Political Science and the Model United Nations (MUN) student organization at UCA. The 54th Arkansas Model United Nations (AMUN) Conference will take place on the campus of UCA on November 22-23, 2019. The AMUN is an experiential learning activity with the primary goal of providing high school students with a unique opportunity to enhance their communication skills, improve their critical thinking skills, and increase their understanding of diplomacy and international politics. The annual AMUN conference provides a setting in which students are able to simulate representatives of various countries throughout the world in the decision-making bodies of the United Nations. Students who participate in the AMUN conference will develop an appreciation for the social, political, and economic systems of their respective countries. Students are also able to gain an understanding of the history and structure of the United Nations. The most important lesson that the students will have the opportunity to learn is the importance of cooperation in dealing with global problems. We encourage all high schools in the state of Arkansas and neighboring states that currently have Model United Nations (MUN) programs or are interested in developing Model United Nations (MUN) programs to participate in the annual AMUN conference at UCA. Depending on the level of experience, high school students may participate as pages, delegates (official delegates or co-delegates), and observers. Teachers, faculty advisors, and sponsors may contact the AMUN Liaison to Faculty Advisors for more information about participating in the AMUN conference. For those college/university students interested in serving on the staff of the AMUN conference, we welcome online applications.